One can’t help but feel that the new Civic Type R marks the definitive end of an era. While the last truly high-revving 4-cylinder was dropped with the introduction of the K24 into the 9th gen Si, it wasn’t exactly a hard detour from the K engines that came before it. The turbocharged powerplant of the new Type R, however, states emphatically that Honda is done with the past, and embracing a force-inducted future. Admittedly, its a step forward performance wise, but it is a tough move for those that embrace the nostalgia of Honda’s simpler past. 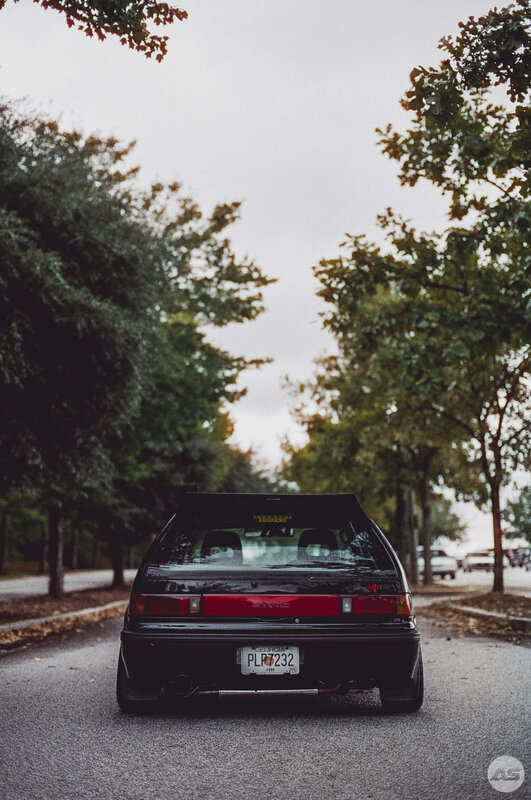 The EF Civic represents the beginning of Honda’s golden era as the first generation to take advantage of Honda’s VTEC, the technology that would define Honda performance in the nineties. Paired with the B16A, as this one is, the Civic could be pushed to 8000 rpm, with a more than ample 170hp. Owner Alex Grant purchased this Civic from longtime owner Guy Haynie several years ago. Both are graphic designers by trade, and work for Atlanta-based automotive magazine S3. 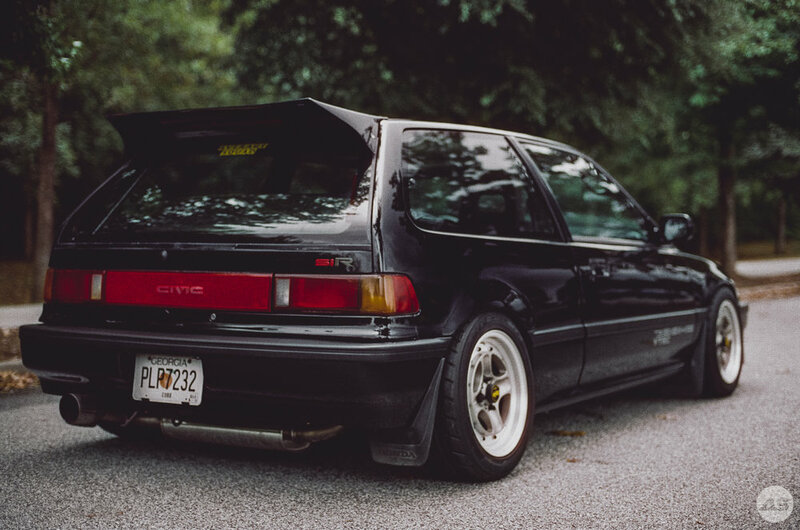 Since his ownership, Alex has brought the nearly thirty year old hatchback back to tip-top shape, while also adding his own flavor with a Tanabe Medallion Exhaust and Osaka JDM Devil rear wing. Most recently, he treated the Civic to a respray of the factory black in time for the Southrnfresh 7 event. Our favorite part of this car has to be the Work Equip 40s in period-correct sizing, with meaty 205/50 Nitto NT05 tires. This throwback design was re-released last year by Work, and has won us over, especially when mated to the appropriate chassis. The interior has been kept relatively stock, which is admirable. The purpose-built designs of this era are easily some of Honda’s best. A Personal steering wheel and K-Tuned shifter are welcome touches, however. The end of the Golden Age of Honda doesn’t need to a time of mourning. As technology changes, so do the cars of the era. Our fathers saw the changes in muscle cars in the seventies, and their replacements weren’t 300hp turbo hot-hatches. We aren’t at the end of performance cars. That being said, the cars of the nineties have cemented themselves as classics and deserve to be treated as such. Owners like Alex are preserving this experience for future generations, and for that we are grateful. This feature was shot on a Nikon F3HP with Cinestill 800T. The film was processed by IndieFilmLab.